Moore’s movies push for liberal agenda items such as government-run healthcare, revolutionary socialism, and stringent gun control. Michael Francis Moore was born in Davison, Michigan (near Flint) in 1954. His father, Frank Moore, was a union member line worker for General Motors, and his mother,Veronica Wall-Moore, was a secretary. In 1972, Moore won a seat on the Davison school board at age 18. Moore dropped out of the University of Michigan-Flint after one year and founded a liberal newspaper, The Flint Voice (later expanded state-wide as the Michigan Voice). In 1986, Moore served a brief four-month stint as the editor of the left-wing San Francisco-based Mother Jones magazine but was quickly fired, allegedly for inadequate job performance. Senior Mother Jones staff members criticized Moore as being so rigidly ideological that he opposed publication of a legitimate article simply because he disagreed with its conclusions. Moore eventually settled his $2 million wrongful termination lawsuit for $58,000, which he used as seed funding for his first film, Roger & Me. Moore has been widely criticized for the contrast between his significant person wealth his left-wing, redistributionist opinions regarding economics. In a 2011 interview with CNN anchor Piers Morgan, Moore refused to accept that he was part of the richest one percent of Americans. Morgan said, “I need you to admit the bleeding obvious. I need you to sit here and say, ‘I’m in the one percent.’ Because it’s important.” Moore denied Morgan’s claim. Appearing at a 2011 Occupy Portland rally, Moore called upon rich Americans to “give back” $1 million, but himself refused to answer questions about how much of his $50 million he was willing to contribute. Moore has ardently advocated in support of labor unions and union privileges. In 2011 he opposed a Wisconsin law reforming government worker collective bargaining and tweeted that he would not hire any non-unionized staff on his future movies. In 2012, he joined pro-union rallies in Wisconsin. Echoing this sentiment, Daniel Radosh wrote in Salon that Moore discouraged writers from joining the Writers Guild and that once they did join, writers relied on the union to secure payments, credits and residuals that Moore was allegedly “trying to screw them out of.” Moore called this allegation a lie; but the author quickly noted that a spokesman for the Writers Guild confirmed that on more than one occasion writers came to the Guild for help in dealing with what they perceived as Moore’s unfair treatment. According to a Mother Jones report, Moore threatened a pair of employees that if they joined the union, he’d “only be able to afford one” and would fire the other. Moore has produced or directed twelve documentaries and written eight non-fiction books, which have together grossed hundreds of millions of dollars worldwide. In Moore’s movie Capitalism: A Love Story, Moore argues that, “Capitalism is an evil… and you cannot regulate an evil. You have to eliminate it.” He casts capitalism as responsible for the housing crisis, the recession, decaying cities and unemployment, and the bailout of financial firms at the expense of the middle class and in the end exhorts the audience to help him defeat the capitalist system. In his movie Sicko, Moore blasted America’s healthcare system as broken by greed. Moore later said that he hoped that the movie would inspire change towards a universal healthcare system. In the 2003 film Bowling For Columbine, which was billed as an anti-gun documentary, Moore implies through several hostile references to corporate greed, fraud and profits that manufacturing military hardware is to be blamed for gun violence in America. 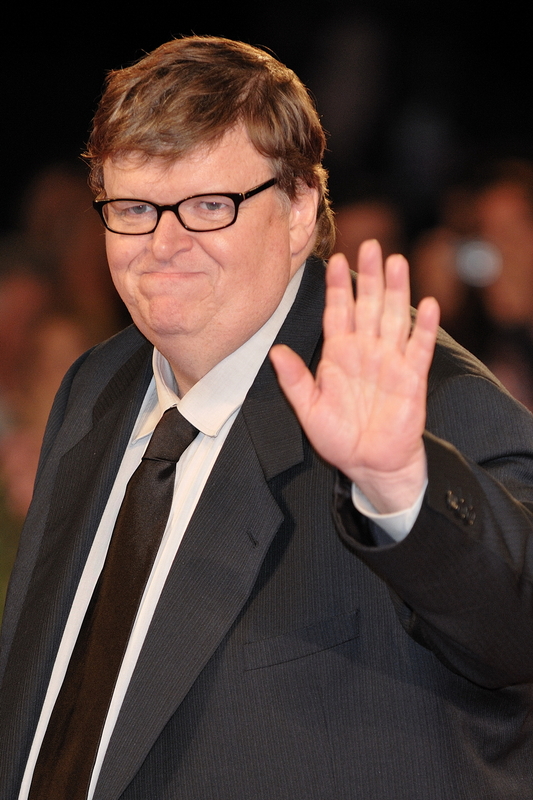 Fahrenheit 911 and his more recent works, Michael Moore in Trumpland and The Terms of Surrender, were openly partisan attacks against Republican Presidents George W. Bush and Donald Trump. The unorthodox left-wing author Christopher Hitchens wrote in Slate that “Fahrenheit 9/11 is a sinister exercise in moral frivolity, crudely disguised as an exercise in seriousness. It is also a spectacle of abject political cowardice masking itself as a demonstration of “dissenting” bravery.” Hitchens’s criticism was based on the fact that the film was based on a big lie and a big misrepresentation and sustained only by a dizzying succession of smaller falsehoods. The left-leaning fact-checking group Politifact has found that eight of those claims made in Moore’s movies were mostly or completely untrue. For instance, Politifact twice found that Moore had overstated the popularity of socialism or socialist healthcare policies. Widely known as a liberal activist, Moore has advocated left-wing positions on a wide array of hot-button political issues and often uses his celebrity to support these left-wing prerogatives. Moore used an appearance on Larry King Live to criticize both then-Senator Obama and then-Senator Clinton’s healthcare plans for failing to propose universal government-run healthcare, and he proclaimed that health care was a “human right.” On another occasion, Moore called for a single-payer national health insurance plan, under which the government would control and pay for from tax revenues all healthcare expenditure. In 2015, Moore accused police of practicing racial discrimination against African Americans, called for the release of all people jailed on drug sentences, and said that police should be disarmed. Moore is a regular donor to the Democratic Party and Democratic political candidates. In the 2016 presidential election, he supported the self-described “democratic socialist” U.S. Senator Bernie Sanders (I-Vermont) in the Democratic Party primaries over Hillary Clinton. Moore claimed that he first endorsed Bernie Sanders for public office in 1990 and had been a supporter of his ever since. Since 2006, Moore has given $42,600 in large-dollar contributions exclusively to Democratic candidates and committees. His contribution history includes $5,000 to the Michigan Democratic State Party, over $6,000 to Gary Peters, $4,000 to Sheldon Whitehouse, and max-out contributions to Barack Obama for President, Joe Kennedy, Lon Johnson, Melissa Gilbert, and controversial Senator Robert Menendez.